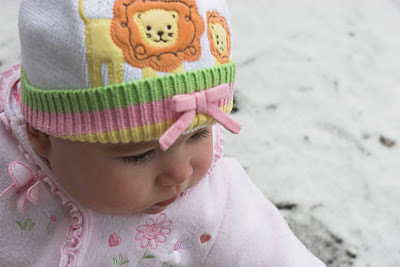 Chasing Proverbs 31: It's snowing again! Eleanor and I ventured out into the snow today. Okay, really, we ventured out onto our back porch, so that I could take some pictures of her. She was so happy outside, and cried when we had to come back in. 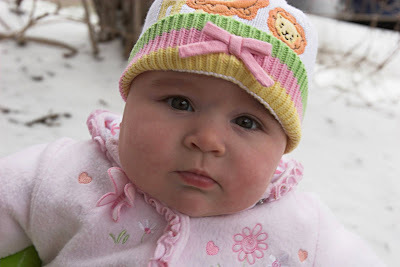 Maybe if they made baby ski masks, we could have stayed out longer, but her little cheeks were starting to freeze, so mean, old Mommy brought her inside. Gorgeous Girl - My little Cade says he wants to meet that babe! That is the cutest hat known to man! And of course on the cutest little baby! Miss Eleanor sounds like my Grace... she LOVES outside. Even when the weather isn't great. She will stand at the back door (banging on it I might add) and crying... she doesn't understand we can't go out when its freezing and raining! Hopefully soon the weather will be nice and we can all get outside more! Maybe she'll grow up loving the snow since she's from here. Thank you for your sweet comment about my family! I enjoy keeping up with your blog. Margaret- I enjoy reading your blog too! It's fun to see what Cade is up to since he's just a couple of months older than Eleanor. 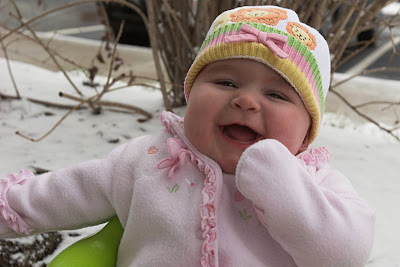 Robin- Eleanor might like the snow, but I like to say she's actually a Texan because she was conceived there. Hmmm...maybe that was too much info. The hat is just absolutely adorable - and the cute baby wearing it ;-)!!!! !